The Lifestyle Lift™ (or LSL) continues to generate publicity, both good and bad, in the beauty business universe. Ongoing lawsuits in the State of Florida brought by attorney general Pam Bondi as well as dueling articles in plastic surgery practice magazines explaining and dismissing the litigious nature of the LSL Company keep the spotlight on this controversial marketing company. It is not known, the malpractice history of the LSL doctors, yet their history of suing and being sued regarding their trademarked name and aggressive marketing practices is well documented in public forums. Let me be absolutely clear, LSL is not a facelift nor any kind or combination of surgical procedures. Once again, the LSL is not a facelift. The precise nature of the company is a little vague but we do know that it is a marketing juggernaut flooding the TV waves, radio and more recently the internet with a multi-million ($15 million or so) dollar ad campaign featuring the once popular Debbie Boone, daughter of teen idol Pat Boone of white-buckskin-shoe fame. When one analyzes this expansive company it is easy to understand why there is a cottage industry of cases (patients) searching for plastic surgeons to re-do or correct the surgeries done under the auspices of this marketing company. The LSL brand is metastasizing to every possible market as researched through their massive call bank in Troy, Michigan. The major problem they are experiencing is the fact that they have grown rapidly, have roughly 90 doctors on the payroll nationwide, and it appears they are having one helluva time controlling the quality of their product. Roughly 20% of their surgeons are actually board certified plastic surgeons. As with any statistical analysis, there is a bell curve describing the quality of their surgeons. It’s just the numbers are so large that the one’s with poor results number in the thousands every year. The LSL marketing machine touts 3-4 facelifts a day (per doctor) and a procedure that only takes an hour to do. When you consider that many of their surgeons are youthful, an hour facelift is improbable. It seems that time is made-up by handling the incisions with haste. Regardless, Forrest Gump said it best, “Life’s like a box of chocolates, you never know what you’re gonna’ get.” You can say same about the LSL. In our efforts to separate what we do from LSL, we make a point of offering only one facelift per day performed entirely by a myself, a real board certified plastic surgeon with no consultationists, no fellows or residents involved with the personalized patient care. 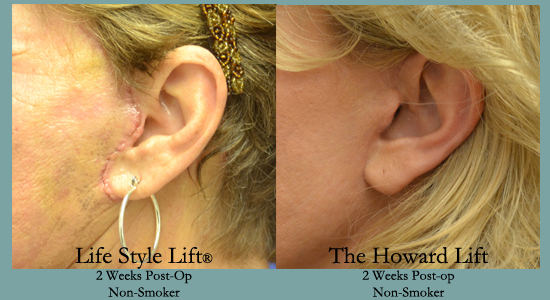 As far as the facelift procedure itself, our Howard Lift has many commonalities with the LSL except it was developed from patient requests and follow-up over many years and not to satisfy a preconceived marketing plan. Also, the Howard Lift is only the base procedure taking care of the cheeks and jawline. Each patient receives a complete evaluation including the neck, eyelids, brow, and nose as needed. A complete skin care evaluation with appropriate skin care including chemical peels and CO₂ laser resurfacing as indicated. All of this is included at a cost comparable to the LSL except you know your board certified plastic surgeon and his entire staff prior to the day of surgery. Follow-up is provided exclusively by myself and my staff so there are no covering physicians or strangers involved in your surgical care or follow-up. *Faceliftology is a registered trademark, registered by Dr. Paul S. Howard, Plastic Surgeon Birmingham, Alabama.